As our understanding of the human memory system broadens and develops, new opportunities arise for improving students’ long-term knowledge retention in the classroom. Written by two experts on the subject, this book explores how scientific models of memory and cognition can inform instructional practices. Six chapters guide readers through the information processing model of memory, working and long-term memory, and Cognitive Load Theory (CLT) before addressing instructional strategies. 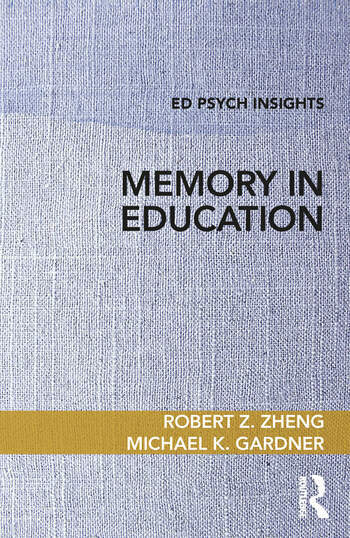 This accessible, up-to-date volume is designed for any educational psychology or general education course that includes memory in the curriculum and will be indispensable for student researchers and both pre- and in-service teachers alike. Robert Z. Zheng is Professor of Educational Psychology at the University of Utah, USA. Michael K. Gardner is Professor and Associate Chair of Educational Psychology at the University of Utah, USA.